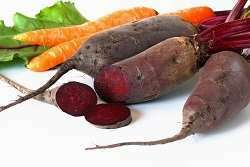 According to engineers, root vegetables aren't only good for the body. Their fibres could also help make concrete mixtures stronger and more eco-friendly. Construction projects have a significant impact on our environment. To combat this, stakeholders in the academic and industrial sectors have been looking for ways to make the industry more environment friendly. The EU-funded project B-SMART will be contributing to these efforts by focusing on concrete and the more culpable of its ingredients: cement. Led by Lancaster University in the United Kingdom, the project will be investigating how nanoplatelets extracted from the fibres of root vegetables can make concrete mixtures more robust and more environment friendly. So far, initial tests have shown that adding nanoplatelets from sugar beet or carrot to these mixtures greatly enhances the mechanical properties of concrete. According to lead researcher Prof. Mohamed Saafi from Lancaster University, the novel cement nanocomposites developed as part of this project "are made by combining ordinary Portland cement with nano platelets extracted from waste root vegetables taken from the food industry." "The composites are not only superior to current cement products in terms of mechanical and microstructure properties but also use smaller amounts of cement," Prof. Saafi said in the news item posted on the University website. "This significantly reduces both the energy consumption and CO2 emissions associated with cement manufacturing." The concrete industry is one of the biggest producers of CO2. The ingredient largely responsible for this is ordinary Portland cement, one of the main components of concrete. The volume of CO2 emitted during concrete production is directly proportional to the amount of cement used in the concrete mixture. Currently, for every tonne of cement made, about 900 kg of CO2 are emitted, corresponding to close to 90 percent of the emissions associated with the average concrete mix. The carbon-intensive cement production process is responsible for 8 percent of total CO2 emissions worldwide. Given recent trends, cement production is expected to double in the next 30 years. Standard concrete is made with water, aggregate (gravel, rock or sand), and Portland cement. Cement is the binding agent that hardens and strengthens the concrete. But when the nanosized platelets of root vegetables are added to the standard concrete mix, the amount of calcium silicate hydrate – the product responsible for making concrete strong – is increased. The researchers found that adding the nanoplatelets made the concrete so much stronger that 40 kg less Portland cement was needed per cubic metre of concrete. This decrease corresponds to 40 kg less CO2 for the same volume of concrete. A stronger root vegetable mixture consequently means that less concrete would need to be used in buildings, resulting in significant environmental benefits. The research team's vegetable-enhanced concretes were also found to perform better than other cement additives available on the market such as graphene and carbon nanotubes. Additionally, they also proved to be much cheaper to produce. Other advantages included a denser microstructure, which helps to prevent corrosion and makes the materials longer lasting. B-SMART (Biomaterials derived from food waste as a green route for the design of eco-friendly, smart and high performance cementitious composites for the next generation multifunctional built infrastructure) will also be investigating the possibility of reinforcing existing concrete structures with very thin sheets made from vegetable nanoplatelets.